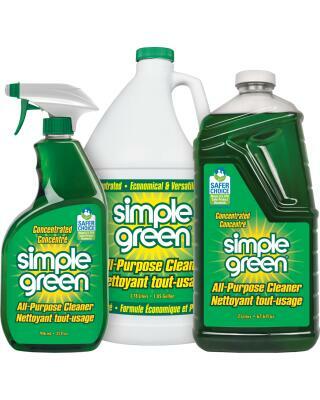 Simple Green All-Purpose Cleaner is the effective, economical and environmentally-sound solution for powerful cleaning and degreasing. The trusted formula is recognized by the U.S. EPA's Safer Choice Program as safer for people, pets, and the environment. Safe for use on all washable surfaces, the non-toxic and biodegradable formula easily removes tough dirt and grime without the use of harsh chemicals. The concentrated formula provides up to 30 times the cleaning value. Use it full-strength for heavy messes or easily dilute it with water for daily cleaning. Removes built-up dirt, grease, food spills, ink, pet stains and other tough grime indoors and out. For use on floors, carpets, walls, countertops, appliances, furniture, fabric, tools and more, this versatile all-purpose cleaner can easily replace a cupboard full of harsh cleaners, detergents, degreasers and laundry pre-soaks, making clean-up simple and safer. The non-toxic formula makes it ideal for use around children and pets. This formula is orally non-toxic per The Globally Harmonized System of Classification and Labeling of Chemicals and readily biodegradable per OECD 301D.